Spaghetti was not on the menu plan for last week, but I could see that Grace was getting bored with her usual chicken with mac 'n' cheese and spaghetti is always a good change for her. She just loves slurping the noodles! 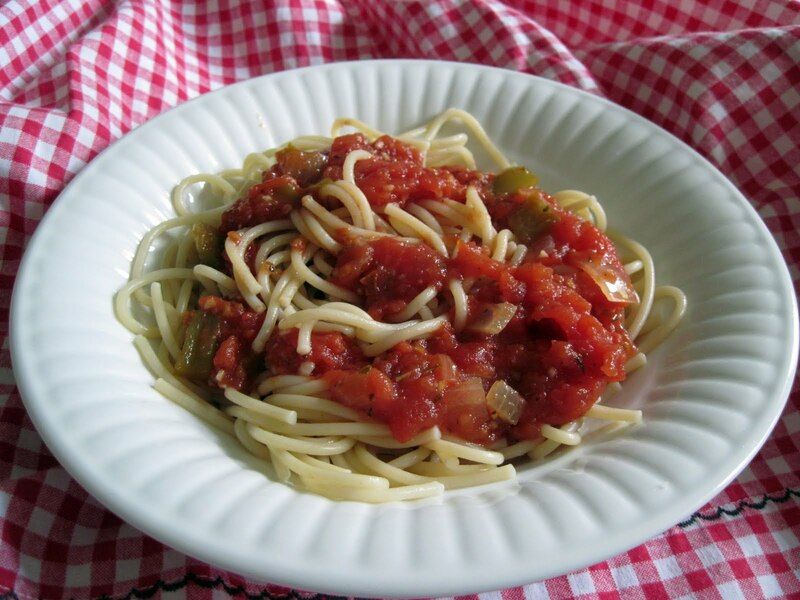 I wasn't in the mood for a heavy meat sauce, so I looked over some recipes that I've been wanting to try for a while now and came across an easy tomato sauce recipe that I could hande without having to run send Joe to the store. Since I was wanting to keep things simple, I didn't make too many changes to the original recipe. I added a green bell pepper since I needed to use it up. And, since I never have fresh herbs in the refrigerator and haven't gotten around to planting that herb garden I wanted, so I had to use a few of the many dried herbs and spices that I can't seem to keep organized in my pantry. Cook diced onions and peppers in hot olive oil, until onions are translucent. Add the tomatoes. Use a potato masher to crush the tomatoes as they cook. Stir the ingredients together, until well combined. Add the Italian Seasoning, along with the salt, pepper and red pepper flakes. Reduce heat and simmer, uncovered for about an hour. When I first tasted the sauce, I wasn't sure how much I liked it. By the end of dinner, I realized that I really enjoyed it. It was just so different than our normal, meaty sauce. After eating the leftovers for lunch today, I realize that this sauce is soooo much better the next day! So, from now on, I'll be making a batch of this sauce the day before I plan to serve it for dinner. I served 1/2 cup of sauce over 1 cup of cooked spaghetti. I also made a side salad and garlic breadsticks. By the time I finished my spaghetti and bread stick, I was too full to eat my salad. This made 7 cups of sauce. You can't beat that calorie count! This looks quite yummy. I will have to give it a try. I'm visiting from Tuesday's Tasty Tidbits. Yum! Homemade sauce is the best....especially the second day! Thanks for linking up with Made From Scratch Tuesday! That really sounds simple and delicious. You could add roasted red bells or roasted chilis. Yum! Oh my goodness. It's one in the morning, and I should be going to bed, but instead I'm looking at your delicious food and my stomach is grumbling - because, well, there's NOTHING better than spaghetti! :D I (surprisingly!) have all the ingredients for this, and will totally be making it in the morning!